Hands up who has heard of the by now iconic Lancome Blanc Expert UV Perfect SPF50? That was one of the first items in the Blanc Expert stables and it has remained ever since. I personally have not tried it though because the price was steep 😛 But it has remained a skincare icon for a long time. 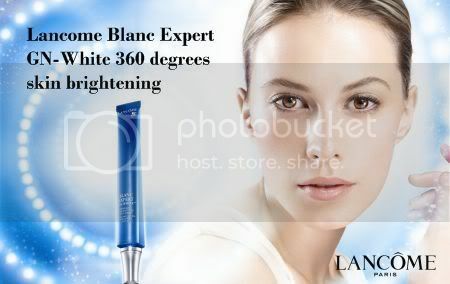 Lancome has taken things up a notch with their new Blanc Expert GN-White formula which is a reformulation of the Blanc Expert whitening skincare line that targets melanin under your skin – the main causes of brown spots – and thus more effective skin brightening. I’m not sure if it is available outside of Asia but this line is targetted at the Asian market. I’ve used whitening skincare before (not Lancome) and while I will attest to my skintone evening itself out and maybe some lightening of pigment spots and freckles nothing can eradicate them and nothing short of skin bleaching will turn you from dark to light so do be wary of skincare that can promise you this! is it any t&C in order to gt the free samples? 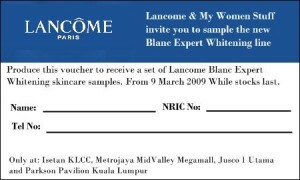 I’m not sure if the samples are still available but print out the voucher and try your luck. Nothing more required. I’ve never used any whitening skincare products until my recent trip back to Malaysia. I’ve brown spots on my cheeks from the breakouts I get before my period. They take forever to go away, so I decided to try some whitening serum from Kose. I’ve been using it for 3 weeks and I can see it really lighten the spots! 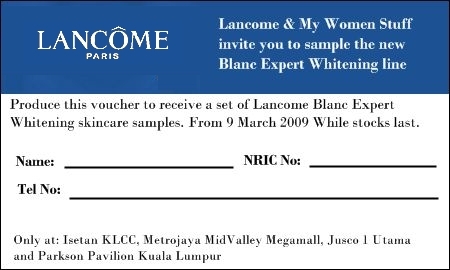 I haven’t seen any whitening products here but lots of self-tanning stuffs 😀 Anyway, I’ll check out the Lancome boutique or Sephora to see if this product is available here. I have been using Lancome products for two years. Personally, I like them a lot. The sun block with spf 50++ is the best one I have ever used. It is very light not sticky at all. It also lasts very long. I am using the whitening range now. All in all, it is suitable for my skin. Today I went to their institute too. It was fantastic!